My Cooking Light Group recently had a dinner with the theme of cooking a dish from a favorite chef. I love that theme! I wanted to cook a Michael Symon recipe because the meal my son and I had at his Lola Bistro in Cleveland was outstanding. Plus, I like Symon's personality, and respect his choice of staying in the Cleveland area instead of heading to a bigger city. The trouble is, very few of Symon's recipes are appropriate for a Cooking Light Group. I finally found one for Aubergine Caviar on the Food Network website. It doesn't seem like the food he's known for, but it fit the bill for the dinner. Plus, it incorporates a lot of the veggies that are in season now -- eggplant, tomatoes and peppers. It turned out OK -- the flavor was pretty mild. 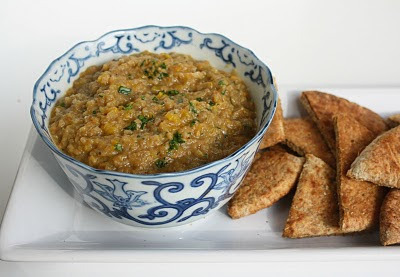 To be honest, I prefer my own recipe for Melitzanosalata (Greek Eggplant Dip), which is ironic, since Symon is of Greek descent, as well as an Iron Chef. I suspect the dip tastes better when he makes it. Preheat the oven to 350 degrees. Oil the eggplant, peppers and tomatoes. 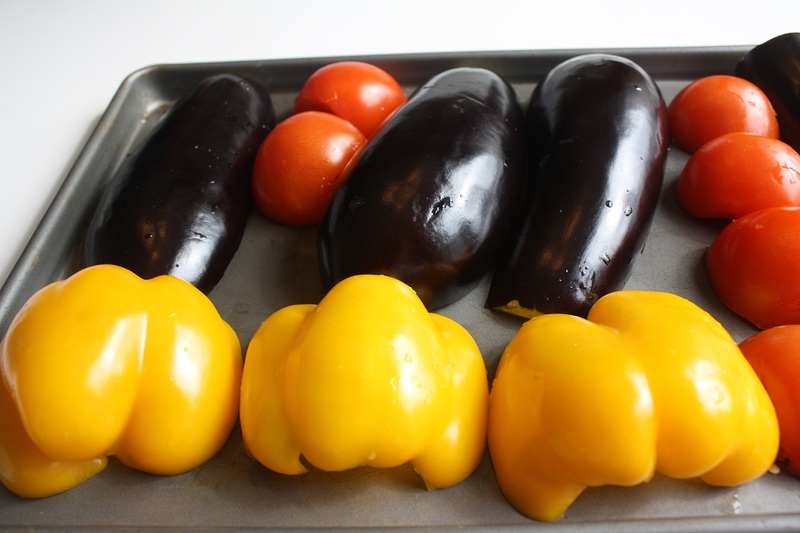 Place them on a baking sheet, season with salt and pepper and place them in the oven. Roast until soft, about 20 minutes. (These weren’t soft at this point so I increased temp to 400 degrees and baked another 10 minutes. In the future, I’d do them at 400). Peel eggplant, peppers and tomatoes. Saute the garlic and onions in olive oil (season with salt and pepper) over medium-low heat until they are translucent and aromatic. Put mixture in food processor and add garlic-onion mixture, vinegar, orange juice, coriander, olive oil, yogurt and salt and pepper. Fold in chopped parsley. Season, to taste, with salt and pepper, and serve with pita wedges. (I brushed the pita wedges with olive oil and toasted thems). 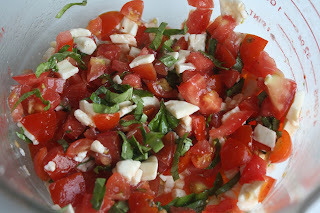 Someone has deemed it locavore month in Rochester, so here's a recipe that takes advantage of the season's wonderful tomatoes and basil, which came from my own garden. This recipe is only good when tomatoes are in season locally -- winter supermarket tomatoes just don't cut it. 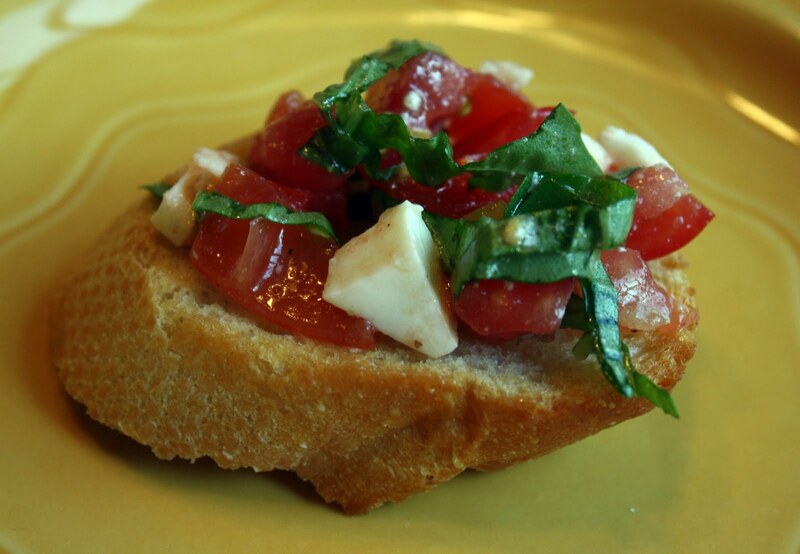 This recipe is from Mario Batali, although my friend Melissa makes something almost identical. If you have a grill going, you can grill the bread. I usually just brush the breads with some olive oil and sprinkle with a little salt & pepper, then bake the breads at 400 degrees for about 5 minutes. Either way tastes great. Preheat a gas grill or prepare a fire in a charcoal grill (or preheat oven to 400 degrees). In a medium bowl, combine the tomatoes, mozzarella, garlic, oregano, basil, red pepper flakes, and oil and toss or stir gently to mix. Season lightly with salt and mix gently again. Taste and adjust seasonings if needed. Set aside. Arrange the grilled bread on a platter, top with the tomato mixture, and sprinkle with coarse salt. Serve immediately.